Back on August 17th my granddaughter and I were out in the front yard trying to get a photograph of a hummingbird that was feeding on some turk's caps. All of a sudden I hear her cry out "paw paw look!" 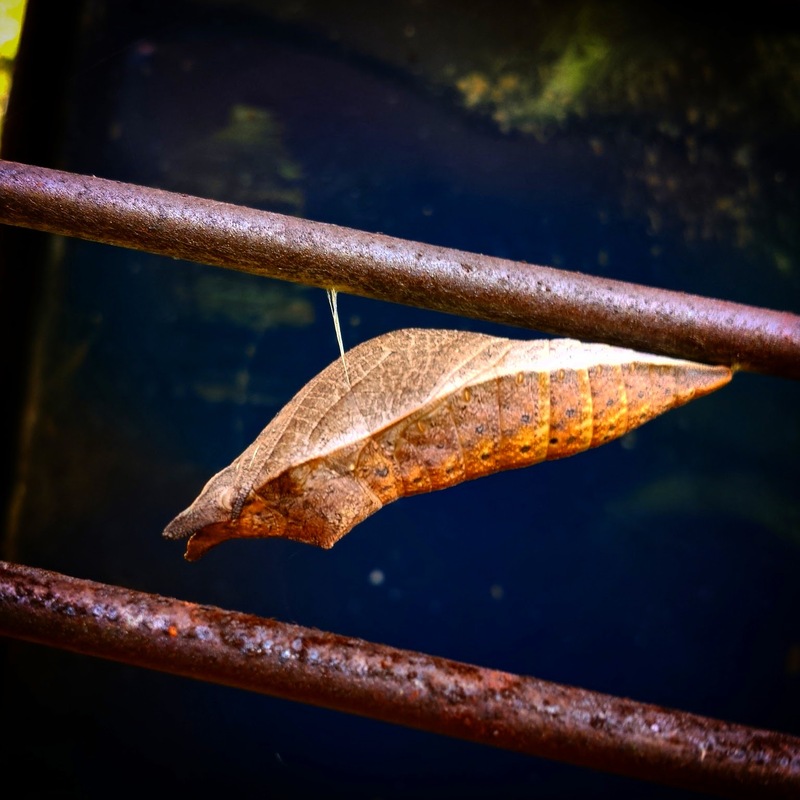 I turn to see the chrysalis of a spicebush butterfly attached to a metal birdhouse we have hanging in one of our flower gardens under a camphor tree which, by the way, is one of this butterfly's host plants. I had been standing right next to it and never noticed. I'm constantly amazed how she has become adapted at observing things, most times before I do. We decided to keep an eye on it day to day to see if we might be lucky enough to be around when the butterfly emerged. That was to never be. What I should have done was placed it in a jar protecting it from its natural enemies. Today we found that it had a tiny hole in it. And when I saw this I knew it meant trouble. This is the workings of a chalcid wasp. These tiny wasps lay eggs into the chrysalis during the time that it is formed when the tissue is soft. The eggs hatch and the resulting larva consume the insides of the chrysalis and eventually develop into wasps which then bore a hole, as seen above, to escape. Note in the first photo how the back end of the chrysalis is relatively straight. In the second photo it is bent. This is one of the signs of chalcid infestation. 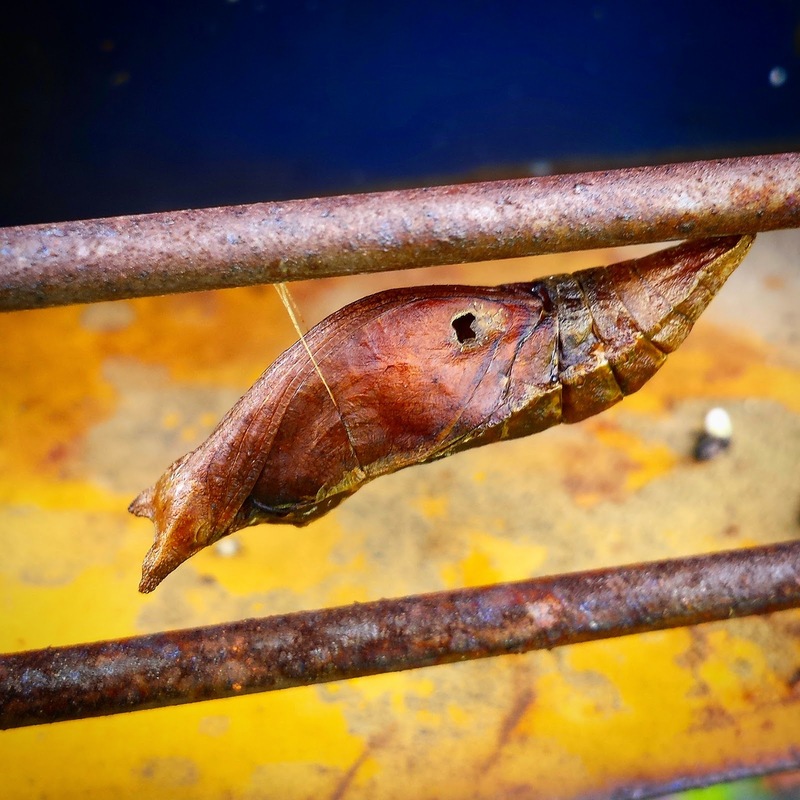 Once the eggs of the wasp develops inside and begins to consume the developing butterfly within, the chrysalis dies and the muscles that once held it straight relax causing the bend to form.